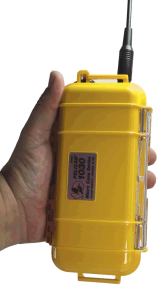 Byonics MT-AIO is a self-contained GPS, TNC and battery operated 10w Transmitter in one unit. The utility of this device is amazing. Self contained and rugged. Batteries last longer than most events. Turn it on and forget it. I run this unit commonly with a mag mount for better coverage.